James Collins scored a late leveller as the Hatters came from 2-0 down to earn a hugely precious point at Coventry City this evening. It had looked like Luton were going to suffer back-to-back defeats for the first time in the league this season, right up until the 88th minute when substitute Luke Gambin sent over a tantalising cross for Collins to bury with a thumping header, sending the 2,002 visiting fans into raptures. The result saw Town stay second in the table, one point behind Accrington, but now seven ahead of fourth placed Wycombe with just nine games to, starting at Newport County this weekend. Earlier, boss Nathan Jones made three changes, bringing in Collins, Harry Cornick and Scott Cuthbert for his first start since November, Elliot Lee and Olly Lee relegated to the bench, with Andrew Shinnie dropping out. Town got off to the worst possible start on just three minutes when Ryan Haynes produced some lovely skill on the wing, his ball across the area fired goalwards by Tom Bayliss, Marek Stech parrying and Peter Vincenti on hand to volley in the rebound. The Hatters might have levelled on nine minutes when Jack Grimmer's loose backpass was collected by Harry Cornick, but he couldn't sort his feet out in time and a home defender nipped in. Collins' 20-yarder was easy for Lee Burge, while the Town forward then went to ground in the area, but his penalty appeals were waved away. Glen Rea almost marked his 100th appearance in style, letting fly from 30 yards, his low effort only just missing the target. City then applied some pressure of their own, Stech gathering Marc McNulty's low drive and parrying Jordan Shipley's curler behind. However, City had what looked a crucial second goal just moments before the break, as Cuthbert gave away a free kick 22 yards from goal. With Luton's wall pushed right back, McNulty curled his effort around it and into the bottom corner with a stationary Stech not covering himself in any glory at all. 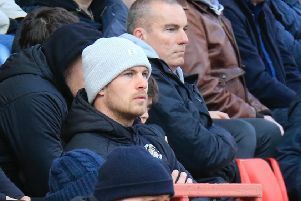 Jones opted against making changes in the second period, with Luton facing an uphill battle to restore parity against a side who possessed the best defensive record in the division, and had only conceded 11 at home. The visitors quickly showed their aren't the highest scorers for no reason though, as Cornick glanced an early header wide, before Town gave themselves a lifeline on 55 minutes when Alan Sheehan's deep free kick was missed by Burge, Cuthbert planting a downward header into the net. Midway through the half, Jones brought on Elliot Lee and Gambin for Rea and Cornick, but neither the changes or the goal really looked to have pepped up Town as an attacking threat. If anything, City looked the most likely to increase their tally, McNulty denied a clincher by the legs of Stech with 14 minutes to go. Luton thought they had a leveller through another set-piece as Sheehan's curler from deep was flicked in by Collins, with Burge rooted to the spot. Unfortunately for Town's striker, the official's flag went up with Town off celebrating, cutting the joy short as they remained 2-1 behind. The visitors went close once more moments later, Luke Berry's lofted pass chested down by Hylton and Stacey's close range effort parried by Burge. Luton did get their leveller with two minutes to go though, when Gambin delivered from the left and Collins powered home his 18th of the season. The equaliser though seemed to breathe life into the hosts, with Luton indebted to Stech for preserving a point, blocking McNulty's attempt, with the rebound fluffed. Stech then gathered Jonson Clarke-Harris's downward header and flung himself to his left to palm Kyel Reid's 25-yarder aside as the Hatters clung on. City: Lee Burge, Jack Grimmer, Rod McDonald, Peter Vincenti (Jordan Ponticelli 90), Michael Doyle (C), Dominic Hyam, Jonson Clarke-Harris, Ryan Haynes, Jordan Shipley (Kyel Reid 64), Tom Bayliss (Liam Kelly 76). Subs not used: Liam O'Brien, Chris Stokes, Max Biamou, Josh Barrett. Hatters: Marek Stech, Jack Stacey, Dan Potts, Scott Cuthbert (C), Alan Sheehan (C), Glen Rea (Luke Gambin 65), Flynn Downes, Luke Berry, Harry Cornick (Elliot Lee 65), James Collins, Danny Hylton. Subs not used: James Shea, James Justin, Johnny Mullins, Olly Lee, Jake Jervis. Booked: Rea 63, Kelly 78. Hatters MOM: Scott Cuthbert – captain brought Town back into the game.